That looks dangerous. What if that sign is up when there's ice, but not enough to drive on? A driver would have no way to know. 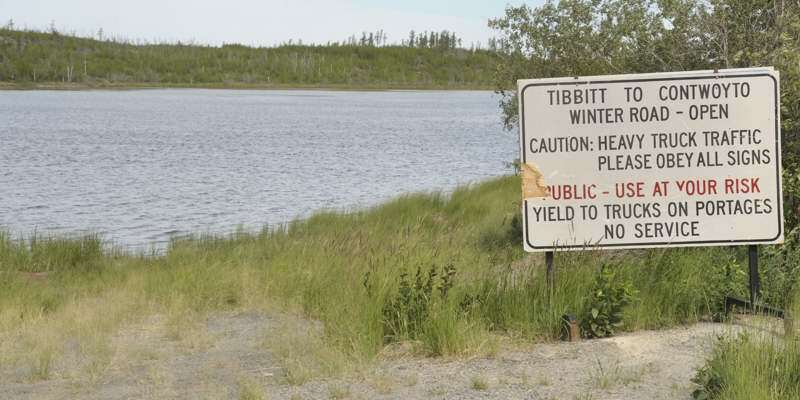 During the winter, if you watch some of Ice Road Truckers, you'll see that the local authority there will cover the open sign with a closed sign if the ice is not thick enough yet. They also physically open and close the road at the start and end of the season. My guess is that there is no point to a closed sign during the summer for the obvious reason. You'd think closed would be the default though... then you'd just need to put the open sign up when it's open and not have to worry about removing the closed sign when it's summer, and putting it back in time that nobody falls through thin ice. The ice road is checked often to make sure it's safe. But still, you'd think they'd rather change the sign only twice rather than FOUR TIMES. Possible that the OPEN sign is covered by a CLOSED sign at the end of the season, with the intention of leaving CLOSED up all summer, only some prankster made off with the CLOSED sign in the meantime. The private venture operating the road in the winter might basically go into hibernation in the summer, and not routinely check the winter road entrance about 70km northeast of Yellowknife. But so long as they resume their checks by the time the lake starts icing over (when the venture needs to start getting the road ready, anyway), and continue them until the lake liquifies again in the spring, no real problem besides giving people a chuckle. Still, if they ever need to redo the entrance sign, I agree it would make sense to make CLOSED the default, and cover it with an OPEN overlay in-season, when the venture's security patrols are keeping an eye on the road and its entrance sign. I'm now wondering if the reason they didn't do that is because of winter storms. Could those be an issue with having a temporary sign when the road is open? According to CBC, a 2012 case study found a road from Rankin Inlet, Nunavut, to Sundance, Man., would generate less than half the financial payback of its $1.2-billion price tag. Moreover, although proponents assert the road would pass by 20-plus mineral exploration projects, the viability of those ventures has not been conclusively demonstrated. Still, the Manitoba-Nunavut highway is especially debatable because of its 10-figure tab. The gap between Rankin Inlet and Sundance is a vast expanse of Canadian Shield lakes and nothingness. Perusing it on a map, one can't help but imagine what a protracted, lonely drive this would be. The 1,100-kilometre highway would connect communities whose combined population is fewer than 10,000 people. By that math, the road would cost more than $120,000 per direct beneficiary. However, such a stringent calculation does not factor in (rapid) population growth, nor the potential for the highway as a foundation for future roads connecting other communities. In the movie industry, there's a name for what's happening to the Manitoba-Nunavut highway: development hell. It's where a project is discussed year after year without ever getting off the ground. If by some miracle Nunavut, Manitoba and Ottawa approved funding tomorrow, the road would take an estimated 15 years to complete. By then, how much more populated will the almost entirely road-less Nunavut, the second-fastest growing province or territory in Canada, be? Long-standing hopes to create road and hydropower links between Nunavut’s Kivalliq region and Manitoba took a step closer to reality this fall at a meeting of Hudson Bay regional governments, according to George Kuksuk, Nunavut’s minister of economic development and transportation. ... His department agreed to demands by mayors of the Kivalliq region to set up a “working group” to study the feasibility of a road link between the Kivalliq’s southern-most communities and Churchill, Manitoba. The roundtable’s proposed road would extend from Churchill to Arviat, Whale Cove and Rankin Inlet. This article describes the southern end of the road as Churchill rather than Sundance. If so the road will NOT connect to the rest of the North American highway network and it will still not be possible to drive to Nunavut without using some other mode of transportation on the way. This probably does shave considerably off the cost, though, and there are train tracks running to Churchill, so for freight it would function just fine. Also, seems another benefit would be the construction of power lines along the route, dropping electricity prices in southern Nunavut. The road would then be needed to service those lines.